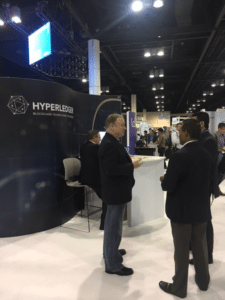 The Hyperledger team recently attended HIMSS in Orlando, Florida. More than 40,000+ people joined us in learning more about the role of technology and IT in healthcare. Hyperledger was there to lend a vendor-neutral, “open source software-first” voice to the rapidly-advancing discussion in healthcare about how to leverage blockchain technologies. 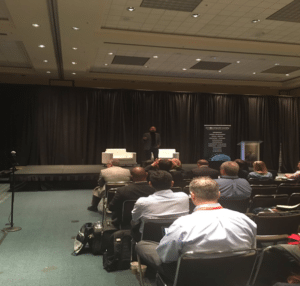 Really this meant we were there to listen, facilitate introductions, educate when we had a specific point of view and, ultimately, advance the readiness of healthcare professionals and organizations to get started with blockchain. HIMSS kicked off with a keynote speech by IBM’s CEO, Ginni Rometty. Ginni shared her belief that to be successful in this new era of computing, companies will need to have clear strategies on AI, cloud and big data. She led on to say that within all of that, transparency, accountability and trust will become even more important, if not demanded. Ginny then spoke to blockchain, its affect on the industry and mentioned Hyperledger as a consortium leading the governance and community development around blockchain technologies for business. Hyperledger set up shop in the Innovation Zone at the enormous Orange County Convention Center. Those who visited us at our kiosk wanted to know what blockchain was, Hyperledger’s role in the market, how blockchain could be applied to healthcare and what some of the opportunities or challenges might be. Across the way from us in the Innovation Zone were our friends at Hashed Health, a member company focused on accelerating blockchain and distributed ledger technologies in healthcare. They brought along a demo of a provider directory that they built using Hyperledger Fabric, one of the three blockchain frameworks in incubation at Hyperledger, and when attendees wanted a solid example of how blockchain worked, we sent them their way. A few other members companies that attended included Accenture, Gem, and IBM. 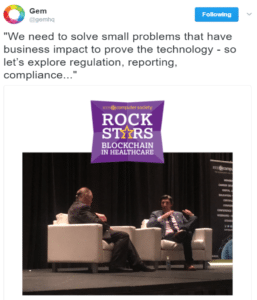 A major focal point for Hyperledger at HIMSS was IEEE’s sold out Rock Stars of Blockchain event. Morning sessions grounded the 200+ attendees with the basics of blockchain tech and it’s applicability to healthcare. Speakers hit themes like interoperability, breaking down silos, increasing patient control while streamlining expensive and time consuming processes, providing holistic, longitudinal views to health. After a great introduction from Conduent’s Tamara StClaire on the basics of blockchain and its promise in healthcare, Abbie Barbir from Aetna gave an excellent talk about the use cases for blockchain in healthcare. 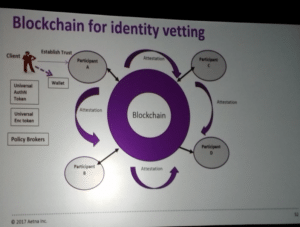 Mr Barbir shared this conceptualization of a blockchain-based ID vetting system. Next, Dr. Jon White and Steve Posnack from ONC shared the work their team has been doing to support and stimulate the adoption of EHR and lately on exploring the uses of blockchain in healthcare. They of course referenced last year’s Blockchain Challenge on ONC Lab. And one really can’t talk about the ONC challenge without discussing the winning MedRec paper. At lunch, Hyperledger sponsored a hands-on workshop for healthcare professionals charged with spearheading their organization’s lab, PoC and pilot use of blockchain technology. The lunch and learn used the recent Hyperledger Healthcare working group survey as the jumping off point to explore popular industry use cases. Much more participation than presentation, the ~30 participants included physicians, vendors, payers, consultants and other HC pros. 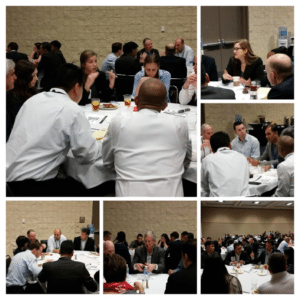 Over the 90-minutes, participants worked at their tables on MVPs for popular healthcare blockchain use cases and discussed the roadblocks that might prevent a PoC. For a full output report, and to join the discussion, check out the Hyperledger Healthcare page and join the healthcare working group email list. 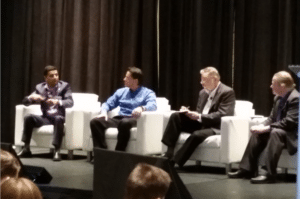 After lunch, Hyperledger Executive Director, Brian Behlendorf moderated a panel with Cerner, IBM and IEEE on the impact of blockchain on connected health. Panelists shared what each are doing with blockchain technology for healthcare and general thoughts on the subject. They then covered confidentiality and patient privacy, exploring such questions as how to deal with private data in a blockchain, how blockchain will change the patient experience, and what regulatory hurdles must be overcome. Some panelists expressed confidence that blockchain technology has the features to transform healthcare, much like other technologies before. Like other approaches, what must not be overlooked with blockchain are all the other environmental factors in healthcare, such as regulation, business models and having a complete architectural design. Others were more bullish about the role blockchain will play to place patients in more control over their data and their healthcare experience. After the panel, Brian and Gem CEO, Micah Winkelspecht held a fireside chat, exploring some of the key questions that had emerged throughout the day. Dr. John Mattison from Hyperledger member, Kaiser Permanente closed the day out with a talk on Defining a Minimum Viable Product (MVP) with Blockchain in Healthcare: Challenges and opportunities. We are very excited that blockchain conversations in healthcare are picking up, we’re learning more and more about POCs and pilots and there is a lot of interest in Hyperledger. If you’re interested in how blockchain can work in healthcare, want to join the discussion further, or have specific questions about Hyperledger, we encourage you to join our Healthcare Working Group here: https://www.hyperledger.org/industries/healthcare. You can plug into the Hyperledger community at github, Rocket.Chat the wiki or our mailing list. You can also follow Hyperledger on Twitter or email us with any questions: info@hyperledger.org.